This is a Paul Hollywood recipe from his ‘100 Great Breads’ book and is delicious. If you haven’t come across this book I can recommend it. Paul used all black olives which I didn’t have, so ours used a mixture of green and black and worked well. Gary prefers green olives so he loved it though I think I’d prefer it with all black olives – but what is life without compromise? This goes wonderfully well with Gary’s Tomato Soup and together they make a smashing lunchtime treat that is substantial and warming as well as really tasty. If you like to knead your dough with your hands, tip the flour, salt, half the olive oil, the yeast and water into a large bowl. I prefer to use my KitchenAid Stand Mixer to do the hard work so I put my ingredients in there and mix on speed 2. Combine your ingredients in the bowl, before turning it out for kneading – approx 6 minutes. I like to use a floured marble slab for kneading, but actually these days I prefer to let my KitchenAid do the work, so it continues and my dough generally spends about 10 minutes in total being well and truly pummelled. I like to lift the dough out of the KitchenAid bowl and quickly oil the bowl lightly before popping the dough back in and setting it to rise on the AGA. But any oiled bowl and warm place will suffice. Cover with a clean tea towel and leave it to rise until doubled in size, time for this will vary depending on how warm it is but generally it shouldn’t take longer than a couple of hours. I like to lay a sheet of greaseproof paper/baking parchment on a tray now instead of greasing the tray – it makes removal of the loaf so much easier when it’s cooked. Paul recommends a baking tray with raised edges (a bit like one for tray bakes), but I used a trusty cold shelf for the AGA instead. His way may make it easier to inset the olives though! Once your dough has risen, mix the basil and 100g or 3½ oz of your olives into the dough. This is a bit messy and the odd olive may escape – our spaniels keep a keen watch out for any such tasty morsel. Next put the dough into/onto your flat or tin and flatten it out until it’s about 2.5cm in thickness. Basil and Olive Focaccia, ready to eat. © Sue Todd 2015. 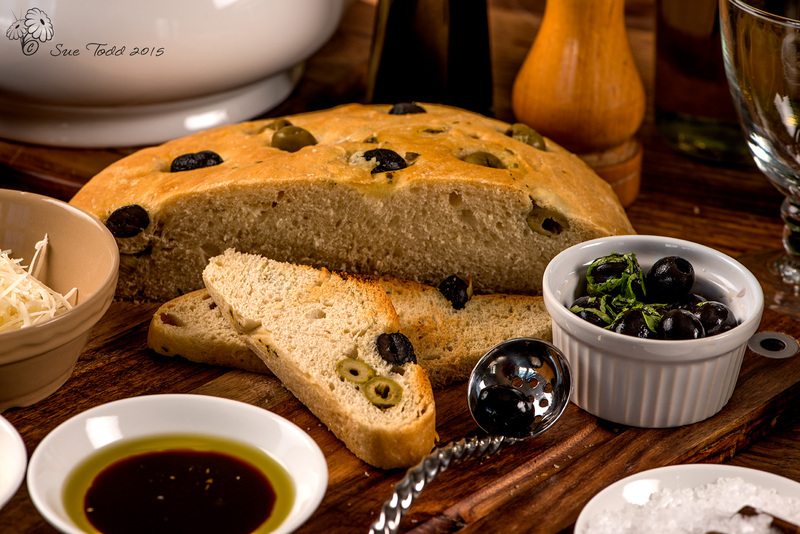 Brush the surface of your Focaccia with olive oil and press indentations into the surface using your fingers. Set to rise once again for about an hour. If you are using a conventional oven you’ll need to preheat it to 230°C/450°F/Gas Mark 8. When it’s ready to go in, brush the dough with salt water before drizzling with what’s left of the olive oil. Press the remaining olives into the surface of the dough before popping it in the oven. If you are using an AGA, mine goes into the baking oven. It will need to cook for around 20-25 minutes until its turning a nice golden brown. Lift it from the oven and transfer gently to a cooling rack to cool. This is where the parchment/greaseproof paper comes in very handy indeed – and it makes washing up a breeze too. I think this works well with soup – see Gary’s Tomato Soup but it’s also great with cheese and makes a lovely light meal with a glass of wine. 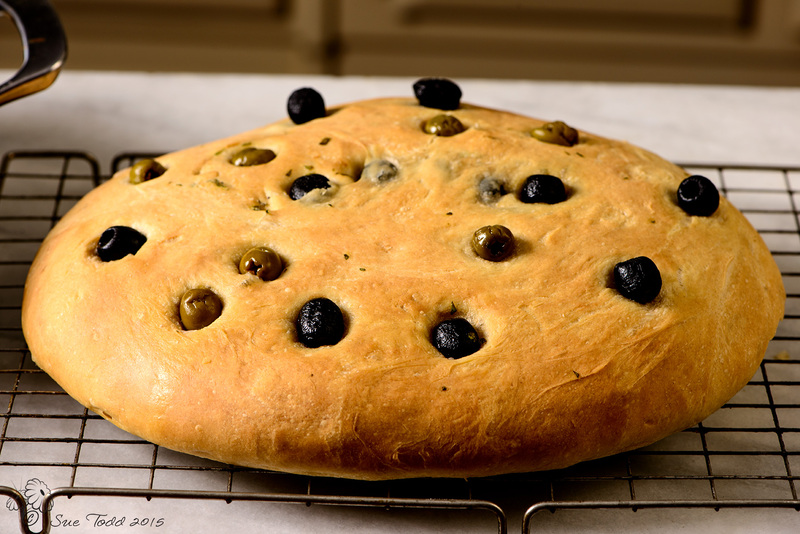 This entry was posted in Breads, Recipes, Uncategorized and tagged Bread, Focaccia, Olives on March 31, 2015 by Sue Todd.